This example illustrates analysis of recurrence data from repairable systems. Repair data analysis differs from life data analysis, where units fail only once. As a repairable system ages, it accumulates repairs and costs of repairs. 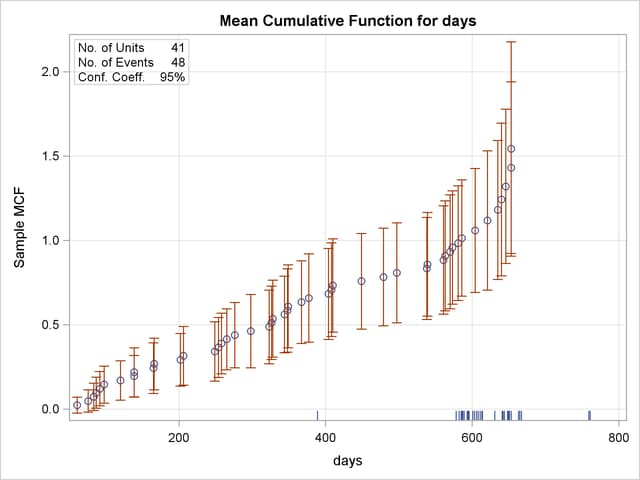 The RELIABILITY procedure provides a nonparametric estimate and plot of the mean cumulative function (MCF) for the number or cost of repairs for a population of repairable systems. The nonparametric estimate of the MCF, the variance of the MCF estimate, and confidence limits for the MCF estimate are based on the work of Nelson (1995) . The MCF, also written as , is defined by Nelson (1995) to be the population mean of the distribution of the cumulative number or cost of repairs at age . The method does not assume any underlying structure for the repair process. The SAS statements that follow create the listing of the SAS data set VALVE shown in Figure 12.31, which contains repair histories of 41 diesel engines in a fleet (Nelson; 1995) . The valve seats in these engines wear out and must be replaced. The variable Id is a unique identifier for individual engines. The variable Days provides the engine age in days. The value of the variable Value is 1 if the age is a valve seat replacement age or -1 if the age is the end of history, or censoring age, for the engine. The following statements produce the graphical display in Figure 12.32. The UNITID statement specifies that the variable Id uniquely identifies each system. The MCFPLOT statement requests a plot of the MCF estimates as a function of the age variable Days, and it specifies -1 as the value of the variable Value, which identifies the end of history for each engine (system). The option NOCENPRINT specifies that only failure times, and not censoring times, be printed in the tabular output. In Figure 12.32, the MCF estimates and confidence limits are plotted versus system age in days. The end-of-history ages are plotted in an area at the top of the plot. Except for the last few points, the plot is essentially a straight line, suggesting a constant replacement rate. Consequently, the prediction of future replacements of valve seats can be based on a fitted line in this case. A partial listing of the tabular output is shown in Figure 12.33 and Figure 12.34. It contains a summary of the repair data, estimates of the MCF, the Nelson (1995) standard errors, and confidence intervals for the MCF. Parametric modeling of the repair process requires more assumptions than nonparametric modeling, and considerable work has been done in this area. Ascher and Feingold (1984), Tobias and Trindade (1995), and Rigdon and Basu (2000) describe parametric models for repair processes. For example, repairs are sometimes modeled as a nonhomogeneous Poisson process. The current release of the RELIABILITY procedure does not include this type of parametric modeling, although it is planned for future releases. The MCF plot might be a first step in modeling a repair process, but, in many cases, it provides the required answers without further analysis. An estimate of the MCF for a sample of systems aids engineers in determining the repair rate at any age and the increase or decrease of repair rate with population age. The estimate is also useful for predicting the number of future repairs.